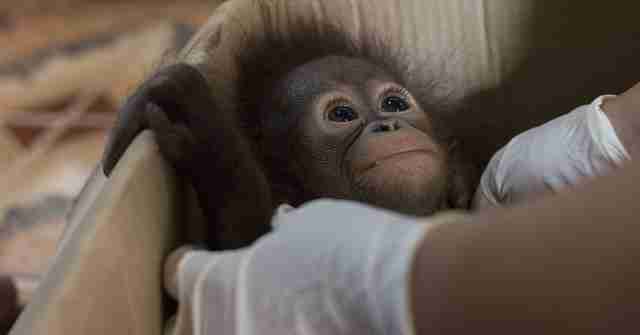 "Mother orangutans will never willingly give up their babies." Little Paijo was rescued just in time. 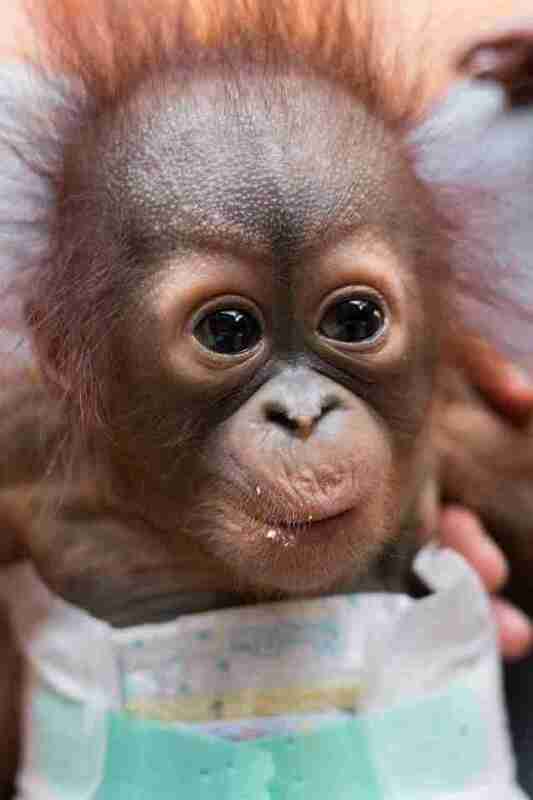 The baby orangutan was only about 3 or 4 months old. He had wide, oval-shaped eyes and a halo of fuzzy red fur. 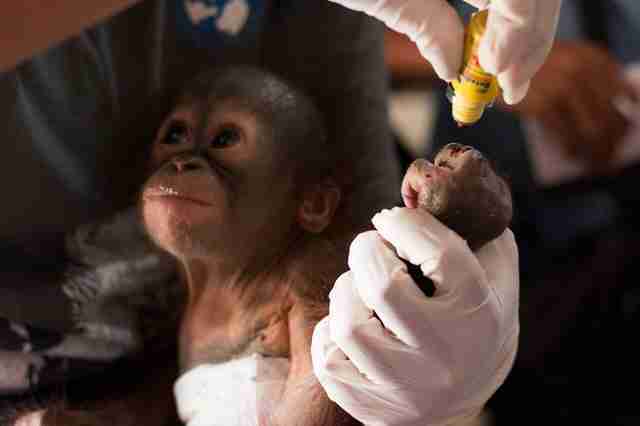 He was also tiny - so tiny that his human caretakers could cradle him in the palm of one hand. As adorable as Paijo is, he shouldn't be in the care of people - he should really be living in the wild with his mother. But unfortunately for Paijo, living with his mom is no longer an option. The team at International Animal Rescue (IAR) rescued Paijo last week after getting a tip-off from a man living in a village in West Kalimantan, Borneo, Indonesia. 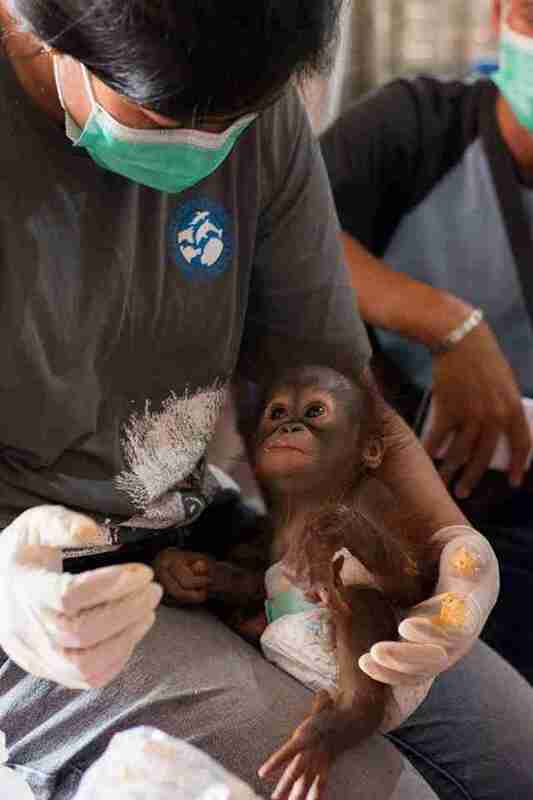 "The man who handed him over has helped us with orangutan rescues in the past so he knows to call on our team for help," Lis Key, PR and communications manager for IAR, told The Dodo. While it's not clear what happened to Paijo's mother, it's safe to assume that she was killed in some kind of human-animal conflict. For instance, it's quite common for villagers in Borneo to kill adult orangutans while tearing down forest to plant palm oil. 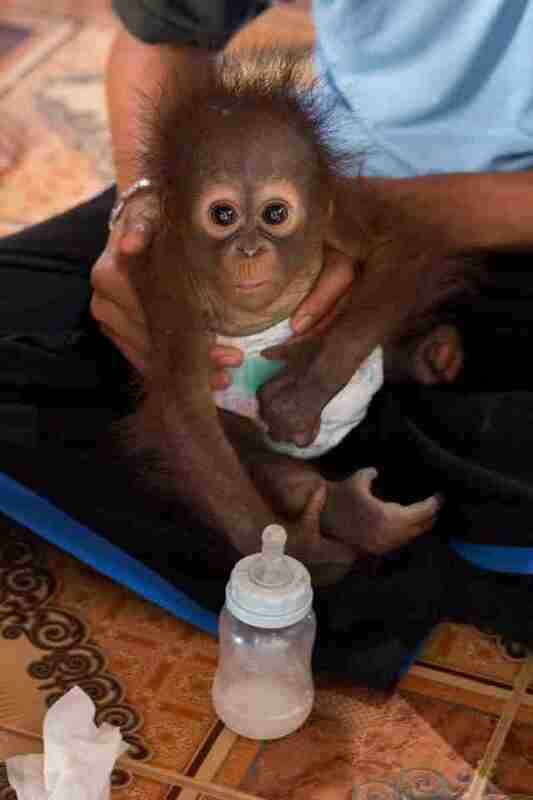 If the orangutan has a baby, people will often sell the baby or keep him as a pet. Whatever happened, Key is positive Paijo is an orphan. 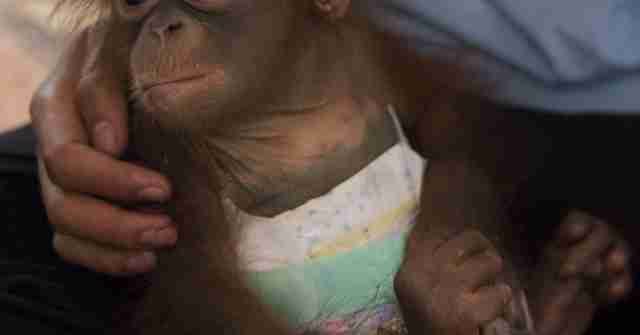 "Mother orangutans will never willingly give up their babies," Key said. "So behind every baby we rescue lies a tragic story and the death of a mother." 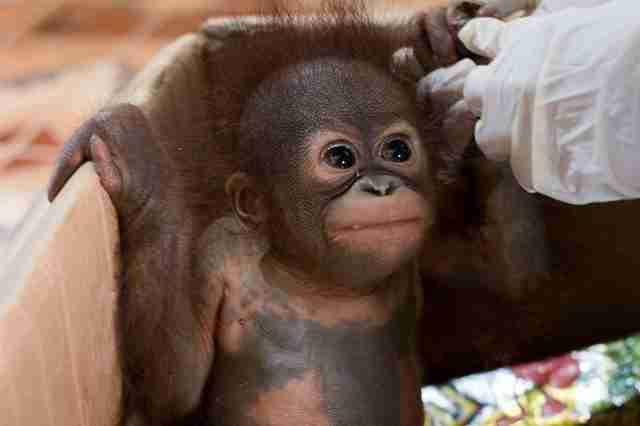 Paijo is the youngest - and smallest - orangutan baby currently at the IAR center, according to Key. 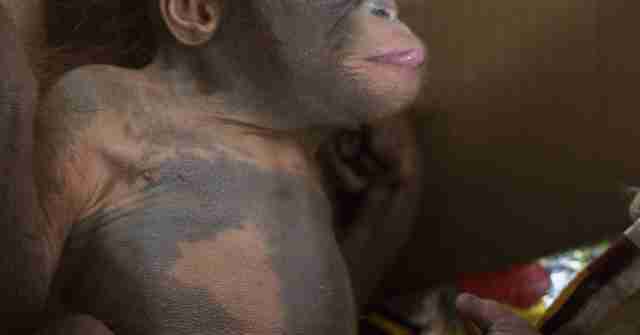 Since Paijo is so young, he's receiving special care at the IAR rescue center. "He is still a tiny baby and needs to build up his strength after being deprived of his mother's milk," Key explained. "Like a human baby, he will need feeding regularly around the clock. A member of the veterinary team will be monitoring him 24/7 and I'm sure he will be in need of food at least every two or three hours day and night." Paijo also has a wound on his finger, which the vet team is keeping a close eye on. "The wound ... could have been caused when he was caught from the wild," Key said. "We have other orangutans in our centre, like Rickina, who have machete wounds likely sustained when their mothers were attacked and killed." Paijo will need to stay with his human caretakers for several years before he can be released back into the wild. After an 8-week quarantine period, Paijo will go to forest school, where he'll get to socialize with other orangutans, and learn important survival skills like foraging, climbing and making nests. 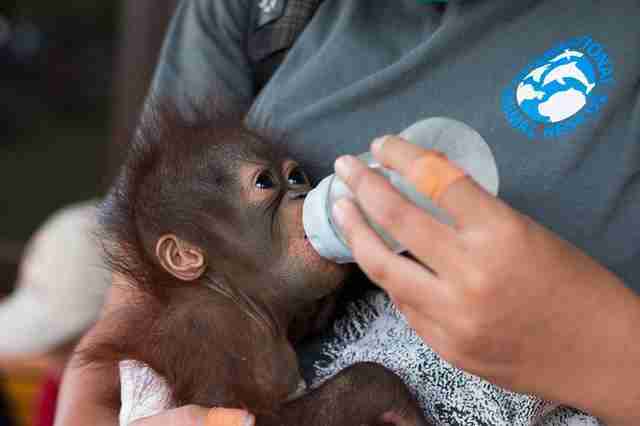 "He will be encouraged to play and climb to help him learn how to be an orangutan," Key said. "He will go to baby school out in the forest each day and, with the coaxing and support of the babysitters, will learn to forage for food hung on the climbing frame and up in the trees." 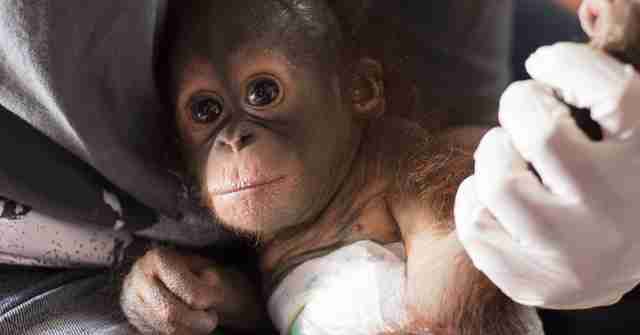 Paijo may not have his mother, but IAR expects him to make a full recovery - and plenty of friends at forest school. 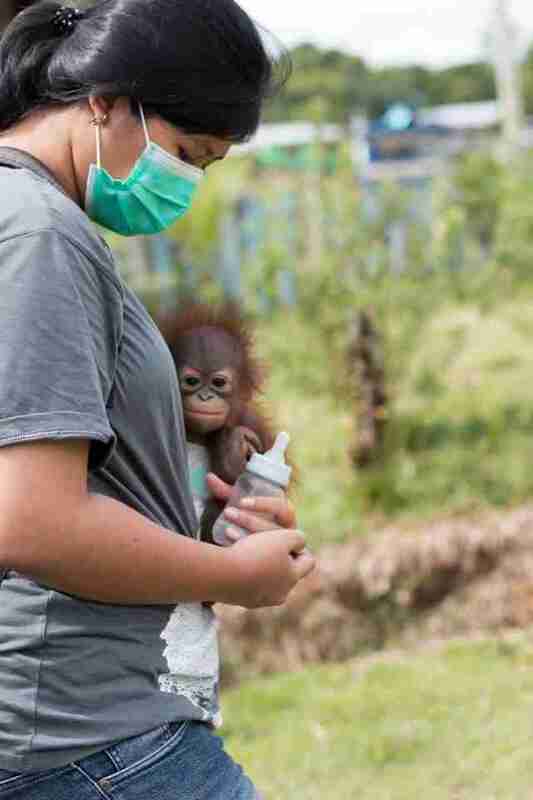 To help care for Paijo, and to support other orphaned and injured orangutans that IAR cares for, you can make a donation to here.